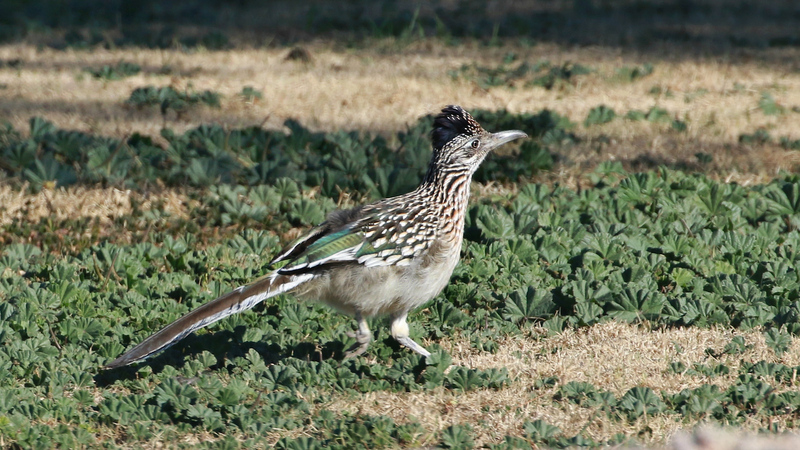 Our tour began in Phoenix, with bright, sunny weather, and a host of wonderful birds, including this Greater Roadrunner. This icon of the Arizona desert was seen in a front yard in Palo Verde. Photo by guide Dave Stejskal. This short winter tour to the bird-rich lowlands of southern Arizona started out great with a productive afternoon visit to the Gilbert Water Ranch s.e. of Phoenix, followed by our thrasher dash to the west of Buckeye the following morning. Weather was super during our first day and a half – and even into much of Day 3 – and we really racked up the birds! Wonderful raptors such as Ferruginous Hawk and Prairie Falcon made appearances, as did Mountain Plover (a whole field of them! ), Greater Roadrunner, Burrowing Owl, Rosy-faced Lovebirds, four species of thrashers (incl. Crissal, Bendire's and the very local LeConte's), a number of wintering sparrows (incl. Sagebrush and Bell's), a feedlot full of Yellow-headed Blackbirds, and even a wayward Black-legged Kittiwake in Phoenix kept us enthused and busy. We lost our 'Chamber of Commerce' gorgeous weather somewhere between Phoenix and Tucson, though, with an unusually cold and wet front from the Pacific affecting our tour – but not diminishing our enthusiasm! Dealing with the weather event proved challenging but, after we figured out what 'Plan B' was going to be, we managed to pull off a fun and exciting tour. For the last three days of the tour we covered quite a bit of ground. 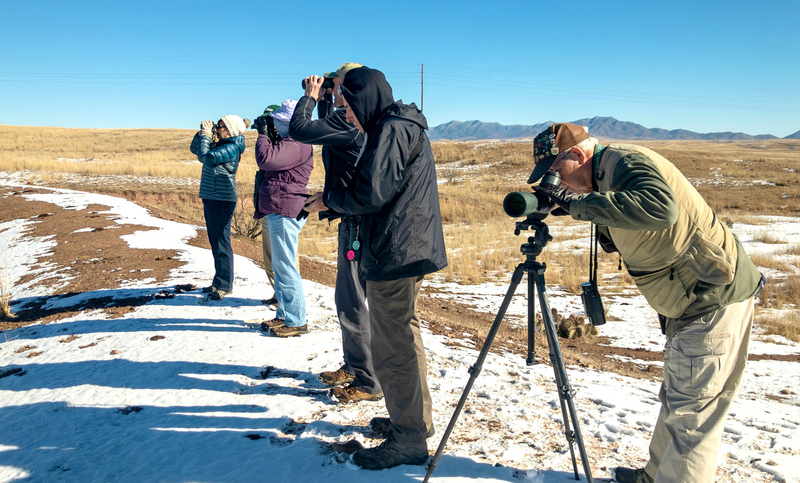 We ranged south to the Nogales and Patagonia areas and east to Willcox and Whitewater Draw in the Sulphur Springs Valley, with each stop providing some delectable birds. Notable among all of the great birds we detected were four species of geese (incl. Greater White-fronted and Ross's), rare Eurasian Wigeon and Greater Scaup, a whole pile of Wild Turkeys in Madera Canyon, a pale-morph Rough-legged Hawk wintering farther south than usual in the Sonoita Grasslands, an unwary family of Harris's Hawks in Green Valley, a few thousand bugling Sandhill Cranes loafing at Whitewater Draw, overwintering Blue-throated (Madera Canyon) and Violet-crowned (Patagonia) hummingbirds, unusual Lewis's Woodpeckers in Green Valley, Northern Beardless-Tyrannulet and three species of wintering Empidonax in the Nogales-Patagonia area, a very confiding Black-capped Gnatcatcher at Patagonia Lake SP, and lovely Western and Mountain bluebirds, among a host of others. An unexpected bonus bird for our tour was this out-of-place Black-legged Kittiwake that showed up at an artificial pond in Phoenix. Photo by guide Dave Stejskal. SNOW GOOSE (Anser caerulescens) – A big flock of these at Whitewater Draw was the biggest flock of geese that we saw on the tour. Most were typical 'Snow' geese, but there were at least a couple of dark-morph 'Blue' geese mixed in. ROSS'S GOOSE (Anser rossii) – Two or three of these were in that big flock of Snows on our final day at Whitewater Draw. GREATER WHITE-FRONTED GOOSE (Anser albifrons) – A single adult at Lakeside Park in Tucson had been hanging out there, with an adult Snow Goose, for quite some time. CANADA GOOSE (Branta canadensis) – Most of our Canada Geese were in the Phoenix area, where they've become quite common in the last 20 years or so. CINNAMON TEAL (Spatula cyanoptera) – A single female at Whitewater Draw was seen by a few of us. Don't worry if you mistook it for a female N. Shoveler - that's what it's often confused with (it's that large bill...). EURASIAN WIGEON (Mareca penelope) – A single adult male at Willcox was spotted by Dan, and we all came away with good looks before he disappeared behind the cattails. This species is now annual in small numbers in Arizona in the winter months. AMERICAN WIGEON (Mareca americana) – That flock at Willcox was mighty impressive! MALLARD (MEXICAN) (Anas platyrhynchos diazi) – We had some nice looks at this bird, often referred to as the Mexican Duck (eBird counts it as a species separate from Mallard now, but the AOU doesn't). NORTHERN PINTAIL (Anas acuta) – Still, one of the prettiest of the ducks, IMHO. RING-NECKED DUCK (Aythya collaris) – This is usually the most common and widespread of the Aythya diving ducks in s. Arizona. GREATER SCAUP (Aythya marila) – There was supposed to be a long-staying female at Patagonia Lake, but all we found was a textbook adult male among the more common Lesser Scaups. BUFFLEHEAD (Bucephala albeola) – A few pretty males at Amado and at Patagonia Lake SP. COMMON GOLDENEYE (Bucephala clangula) – Several females had been found just prior to the start of the tour at that tiny pond behind the police station in Tucson. HOODED MERGANSER (Lophodytes cucullatus) – We counted at least 31 of these extravagantly patterned mergansers at the Kittiwake pond in n. Phoenix. GAMBEL'S QUAIL (Callipepla gambelii) – Great looks at these charismatic quail on our first afternoon in Phoenix. 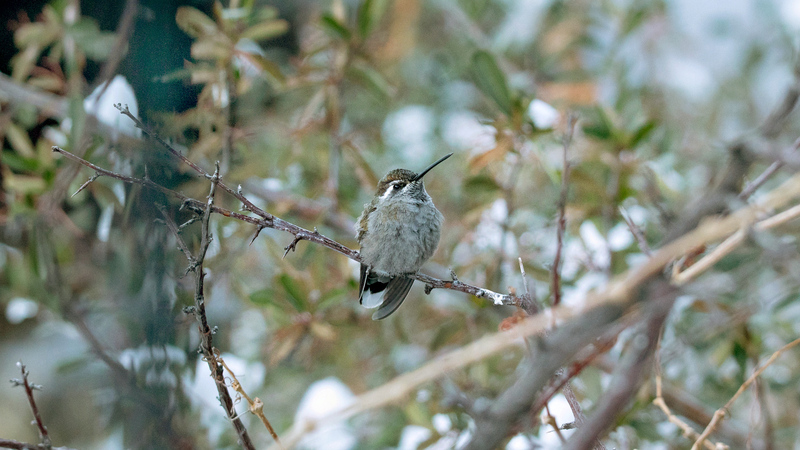 Blue-throated Hummingbirds are another rarity in winter, so we were pleased to see this one that was staying in Madera Canyon for the winter. Photo by participant Jim Greenway. EARED GREBE (Podiceps nigricollis) – Only a few birds wintering here along our route. NEOTROPIC CORMORANT (Phalacrocorax brasilianus) – This widespread Neotropical species now greatly outnumbers the familiar Double-crested Cormorant in s. Arizona. It's especially common in the Phoenix area. DOUBLE-CRESTED CORMORANT (Phalacrocorax auritus) – A couple of birds mixed in with the more common Neotropics. SNOWY EGRET (Egretta thula) – Only on our first afternoon in Phoenix. WHITE-FACED IBIS (Plegadis chihi) – I was beginning to wonder where these birds were hanging out when we came across 1000+ feeding in a flooded field. When I was growing up in Phoenix in the 60's and 70's, we almost never had any of these over-wintering in the state. BLACK VULTURE (Coragyps atratus) – Quite local in s. Arizona. TURKEY VULTURE (Cathartes aura) – Except for the Phoenix and Nogales areas, these mostly pull out of s. Arizona during the winter months. OSPREY (Pandion haliaetus) – A couple of birds in the Phoenix area were wintering there. They get decidedly scarce in the winter in the state south of here. Ferruginous Hawks were seen at several locations; this one perched on a roadside pole allowed us to get a great look at this lovely raptor. Photo by guide Dave Stejskal. NORTHERN HARRIER (Circus hudsonius) – We saw a fine array of plumages in this elegant raptor. SHARP-SHINNED HAWK (Accipiter striatus) – This is the scarcer of the two regularly wintering Accipiters in the state. BALD EAGLE (Haliaeetus leucocephalus) – We could only find one distant perched bird in the s.w. Phoenix area. They're usually more evident than this. HARRIS'S HAWK (Parabuteo unicinctus) – We happened to pull into the right side street in Green Valley, finding four young birds perched up and in nice view. RED-TAILED HAWK (Buteo jamaicensis) – Easily the most common and widespread raptor here in the winter months, we saw an incredible array of plumages throughout. RED-TAILED HAWK (HARLAN'S) (Buteo jamaicensis harlani) – This distinctive form of Red-tailed Hawk (species?) has been very reliable at that intersection out in the Santa Cruz Flats. We saw it in the scope just before it vanished into thin air! ROUGH-LEGGED HAWK (Buteo lagopus) – S. Arizona is typically a little too far south to find this one, but it's been a good winter for Rough-legs in the southern one-half of the state this year. FERRUGINOUS HAWK (Buteo regalis) – A couple of birds were seen very well in the s.w. Phoenix area, but we only saw a couple of others while driving in the Sulphur Springs Valley on our final afternoon. This might be my favorite N. American raptor. SORA (Porzana carolina) – Larry and Karen spotted our Soras for the trip – one in s.w. Phoenix and the other at Whitewater Draw. COMMON GALLINULE (Gallinula galeata) – Several along the Salt River s.w. of Phoenix. Now split from the birds in the Old World. SANDHILL CRANE (Antigone canadensis) – The roosting flock at Whitewater Draw had thinned out some by the time we arrived there in the afternoon, with only a few thousand birds remaining in the flooded basin and adjacent agricultural fields. Still, seeing a few thousand of anything is pretty impressive! We found Bridled Titmouse in Madera Canyon; this one is fluffed up a bit from the cold. Photo by Jim Greenway. BLACK-NECKED STILT (Himantopus mexicanus) – Good numbers at the Gilbert Water Ranch on the first afternoon. AMERICAN AVOCET (Recurvirostra americana) – The Phoenix area always seems to have a few Avocets trying to over-winter. 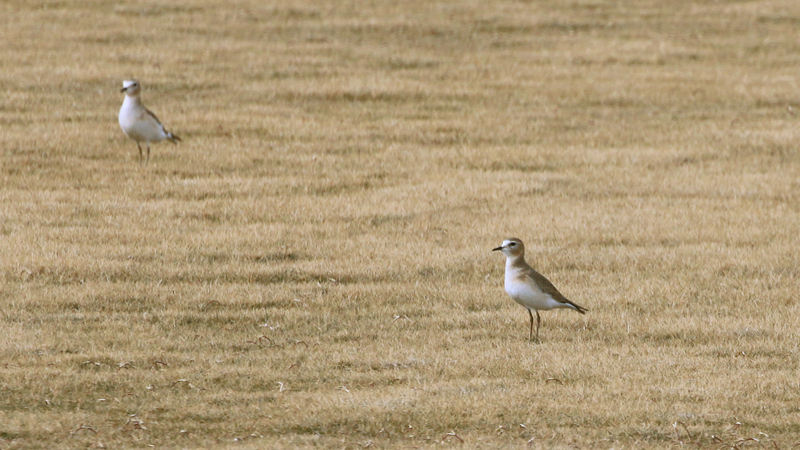 MOUNTAIN PLOVER (Charadrius montanus) – We were just looking too far for these, as Larry kindly pointed out! This wintering flock is invariably found out on the short sod, but today they were foraging out in the taller grass field to the east of the sod farm, where I've never seen them before. Great looks all around! LONG-BILLED CURLEW (Numenius americanus) – We had about 100 curlews in the ag fields near Palo Verde on our first full day of the tour. LONG-BILLED DOWITCHER (Limnodromus scolopaceus) – We didn't see the huge numbers that we sometimes see in the winter at Gilbert that first afternoon. 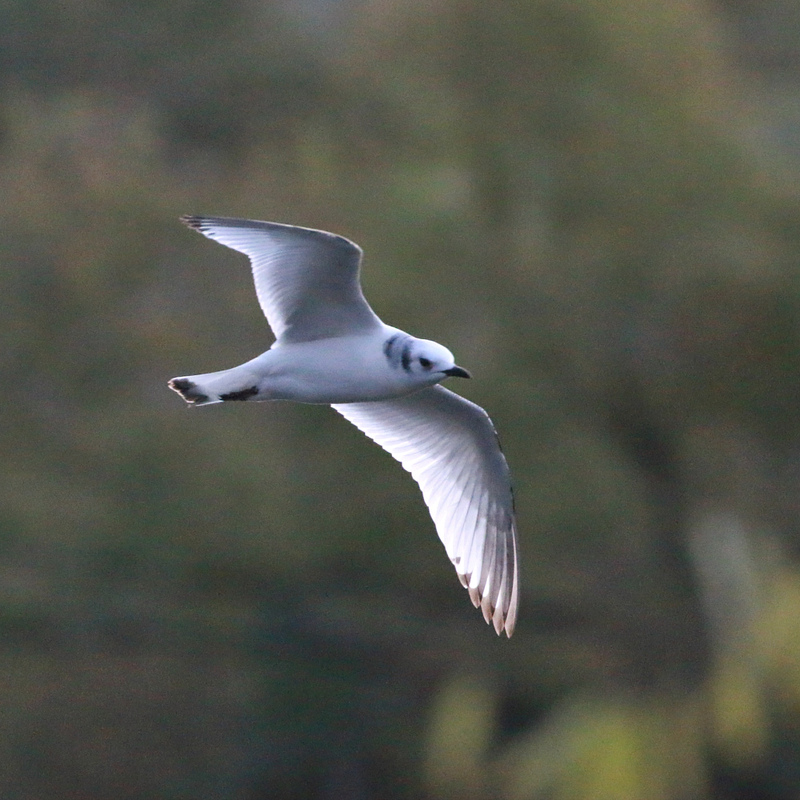 BLACK-LEGGED KITTIWAKE (Rissa tridactyla) – A big surprise for all was seeing this normally pelagic species attempting to winter on an artificial pond north of Phoenix! Overall, the state has just a handful of records, so seeing this one was quite a thrill! INCA DOVE (Columbina inca) – We made a swing by the Red Rock feedlot and found several of these, but no Ruddy Ground-Doves this year. COMMON GROUND-DOVE (Columbina passerina) – Dan spotted one of these sitting quietly just off of the bridge near Kino Springs early one cold morning. WHITE-WINGED DOVE (Zenaida asiatica) – They don't seem to winter much in the Phoenix or Tucson areas, but you can find them at this season elsewhere in s.e. Arizona. GREATER ROADRUNNER (Geococcyx californianus) – We had some great encounters with this charming species. Perhaps most memorably in the front lawn of the house in Palo Verde s.w. of Phoenix on our first full day. Always high on every visiting birder's list of targets! BURROWING OWL (Athene cunicularia) – We almost drove right past this one, but Dawn spotted him peering over the berm at the sod farm! Great looks! BLUE-THROATED HUMMINGBIRD (Lampornis clemenciae) – A real rarity in the winter in Arizona, and especially so in Madera Canyon. This long-staying young male was very confiding. ANNA'S HUMMINGBIRD (Calypte anna) – Usually the most common and widespread of the wintering hummers in the state. COSTA'S HUMMINGBIRD (Calypte costae) – A single male was seen briefly working the flowers behind us as we watched the Kittiwake in n. Phoenix. VIOLET-CROWNED HUMMINGBIRD (Amazilia violiceps) – Thanks to a hot tip, we tracked down one of these beauties visiting a residential feeder in Patagonia. This small town is the best place in the US to see it within the ABA area. BELTED KINGFISHER (Megaceryle alcyon) – This was present on the same little lake in n. Phoenix that hosted the Black-legged Kittiwake. LEWIS'S WOODPECKER (Melanerpes lewis) – This has been a very good winter for this species in s. Arizona. We found two long-staying birds in the little park in Green Valley. With two here in a park with 100 pecan trees in it, I can't help but wonder how many are wintering in the the nearby pecan orchards where there are 1000's of trees! Mountain Plover can be difficult to spot, but once we figured out where they were, we had great close-up views of these winter visitors. Photo by guide Dave Stejskal. ACORN WOODPECKER (Melanerpes formicivorus) – Very entertaining at the feeders in Madera Canyon on our afternoon visit there. GILA WOODPECKER (Melanerpes uropygialis) – The 'default' woodpecker in the Phoenix and Tucson areas. RED-NAPED SAPSUCKER (Sphyrapicus nuchalis) – We had one briefly in the tall cottonwoods along the Santa Cruz R. south of Tumacacori. LADDER-BACKED WOODPECKER (Picoides scalaris) – This one sounds quite a lot like and is about the same size as the familiar Downy Woodpecker. 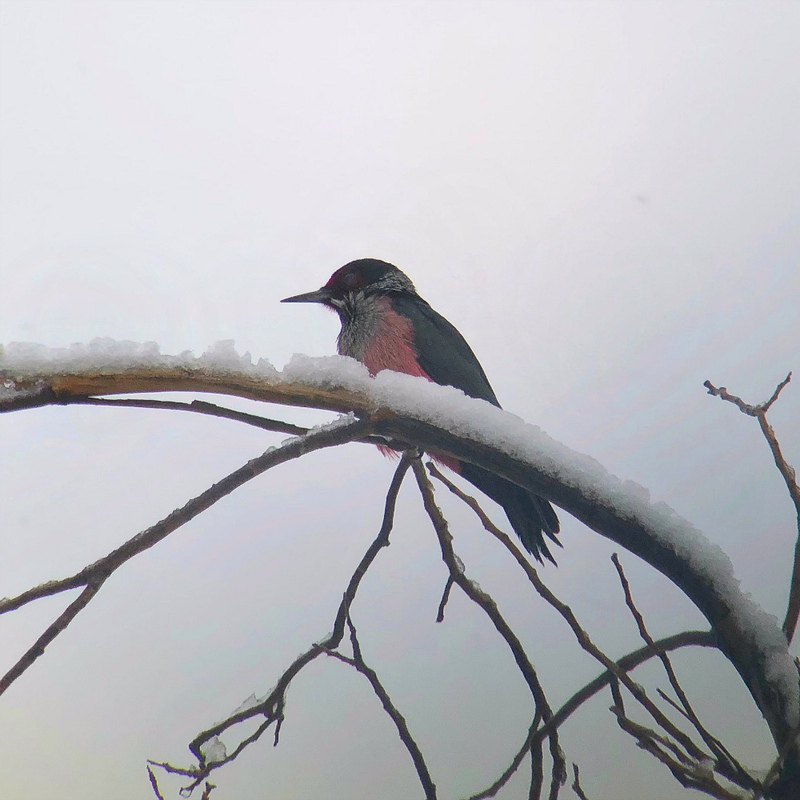 ARIZONA WOODPECKER (Picoides arizonae) – The feeders at Madera Canyon proved irresistible to this s.e. Arizona specialty. NORTHERN FLICKER (RED-SHAFTED) (Colaptes auratus cafer) – This is the flavor of Northern Flicker that we routinely see in the winter in s. Arizona. CRESTED CARACARA (Caracara cheriway) – Karen spotted our only Crested Caracaras as we surveyed the fields north of Marana. MERLIN (Falco columbarius) – Jim got us onto this little falcon perched in a leafless mesquite out in the frosty grasslands north of Sonoita. PEREGRINE FALCON (Falco peregrinus) – A couple of birds on our first afternoon at Gilbert Water Ranch in Phoenix, and then another the next day. 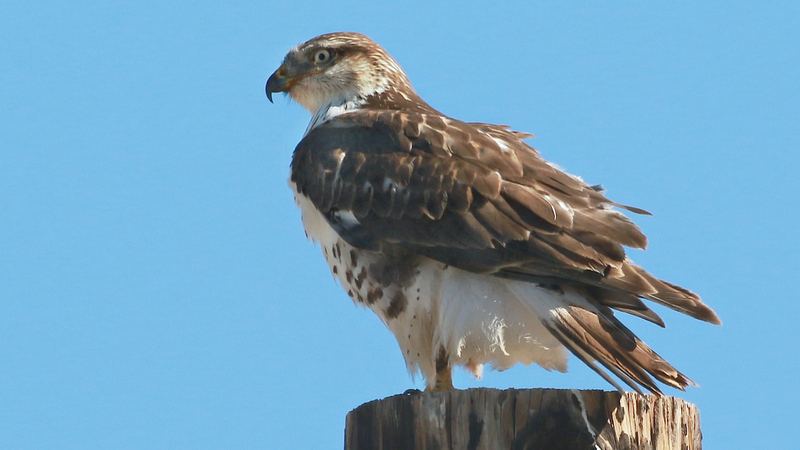 PRAIRIE FALCON (Falco mexicanus) – Perched birds near Picacho and near Sonoita were nice. NORTHERN BEARDLESS-TYRANNULET (Camptostoma imberbe) – One of the numerous quality birds that we found at Patagonia Lake SP. HAMMOND'S FLYCATCHER (Empidonax hammondii) – Only one of these was found during the tour, but that was most likely related to the colder than normal weather. GRAY FLYCATCHER (Empidonax wrightii) – That emphatic tail-dipping exhibited by this species clinches the i.d. in a normally troubling group of flycatchers. 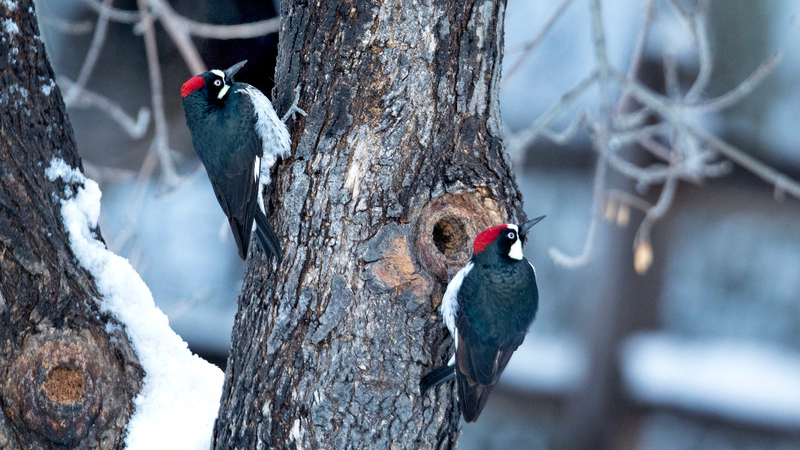 This tour was very good for woodpeckers, including this pair of Acorn Woodpeckers in Madera Canyon. Photo by participant Jim Greenway. DUSKY FLYCATCHER (Empidonax oberholseri) – A single bird seen very well at Patagonia Lake SP. A combination of calls and behavior help to i.d. this one. BLACK PHOEBE (Sayornis nigricans) – Recorded daily on this tour – and always near water. SAY'S PHOEBE (Sayornis saya) – Usually the only species of flycatcher seen in open country in Arizona at this season. VERMILION FLYCATCHER (Pyrocephalus rubinus) – We had quite a few incomparable males along our route this year. This one seems to be dramatically increasing in numbers during the winter months in s. Arizona. ASH-THROATED FLYCATCHER (Myiarchus cinerascens) – A single bird made a brief appearance while we were enjoying our views of that singing LeConte's Thrasher w. of Phoenix. LOGGERHEAD SHRIKE (Lanius ludovicianus) – Not as rare out here in the West as it is in the East. HUTTON'S VIREO (Vireo huttoni) – One of these Ruby-crowned Kinglet lookalikes showed up as we were heading back to the van at Patagonia Lake SP. CASSIN'S VIREO (Vireo cassinii) – This one just didn't stick around long enough along the Santa Cruz R. south of Tumacacori. PLUMBEOUS VIREO (Vireo plumbeus) – This and the above Cassin's seem to winter in about equal numbers in s. Arizona. MEXICAN JAY (Aphelocoma wollweberi) – 'Regulars' at the feeders in Madera Canyon. CHIHUAHUAN RAVEN (Corvus cryptoleucus) – We saw a few birds along the highway as we drove north from Whitewater Draw to Willcox. HORNED LARK (Eremophila alpestris) – Quite a few out in the Sonoita grasslands as we waited in vain for the longspurs to show. NORTHERN ROUGH-WINGED SWALLOW (Stelgidopteryx serripennis) – A single bird s.w. of Phoenix was the only swallow seen on the tour – which isn't too surprising in the winter in s. Arizona. BRIDLED TITMOUSE (Baeolophus wollweberi) – These turned out to be much easier to see at the Madera Canyon feeders than they were along the Santa Cruz River s. of Tumacacori the day before. Yellow-eyed Junco is a specialty of southern Arizona, and we found some cooperative individuals at the feeders in Madera Canyon. Photo by participant Jim Greenway. 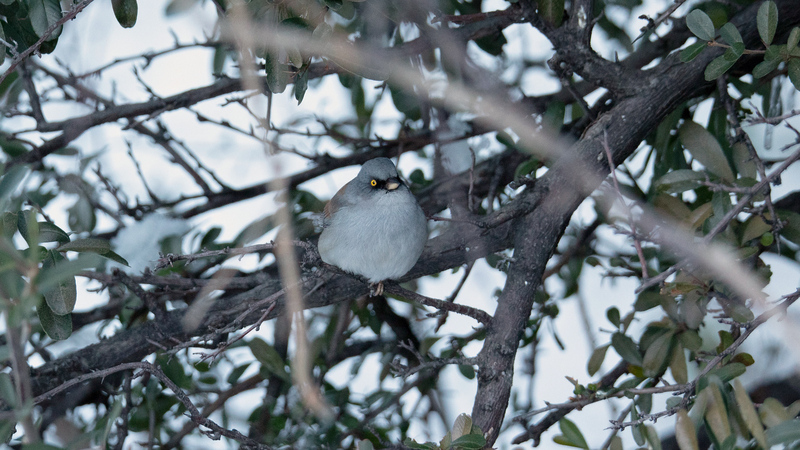 VERDIN (Auriparus flaviceps) – Recorded daily on this tour. WHITE-BREASTED NUTHATCH (INTERIOR WEST) (Sitta carolinensis nelsoni) – I'm not sure if anything will ever come of the talk of possibly splitting this one up into three species in N. America. All three groups sound very different from each other. MARSH WREN (Cistothorus palustris) – We finally got a look at one working the low marsh vegetation at Whitewater Draw. BEWICK'S WREN (Thryomanes bewickii) – We only had this one s. of Tucson on this tour. CACTUS WREN (Campylorhynchus brunneicapillus) – We didn't catch up to Arizona's state bird until the final afternoon as we were leaving Whitewater Draw. BLACK-TAILED GNATCATCHER (Polioptila melanura) – Nicely on our first full morning at the thrasher spot near Buckeye. BLACK-CAPPED GNATCATCHER (Polioptila nigriceps) – A walk along the birding trail at Patagonia Lake SP yielded some nice looks at a female working low in the trees at the east end of the lake. This one has been established at Patagonia Lake for more than a decade now. WESTERN BLUEBIRD (Sialia mexicana) – A few along the road that led up to Madera Canyon. MOUNTAIN BLUEBIRD (Sialia currucoides) – This has been a very good year for this highland species in the lowlands of s. Arizona and we had some great looks of the cerulean adult males at a few places along our route. CURVE-BILLED THRASHER (Toxostoma curvirostre) – This and the Northern Mockingbird were our most common and widespread mimids on the tour. BENDIRE'S THRASHER (Toxostoma bendirei) – That first one at the thrasher spot on our first full morning was nice, but we ran into many more on our drive down to the Santa Cruz Flats from Phoenix. Because of its similarity to the above Curve-billed Thrasher, the Bendire's is one of the most mis-identified of all of the Arizona specialty birds. Lewis's Woodpecker is not common in southern Arizona, but we found two of them in a small park in Green Valley. Photo by guide Dave Stejskal. LECONTE'S THRASHER (Toxostoma lecontei) – It didn't take too long before we tracked down one of these scarce and local thrashers near Buckeye. Thankfully, it sat up and sang for the longest time, allowing us to approach pretty closely for some great looks in the scope! CRISSAL THRASHER (Toxostoma crissale) – This was our third species of thrasher that sat up nicely for us at the 'thrasher spot' near Buckeye. This one is actually the most widespread of all of the thrasher species in the state, nesting in every Arizona county. AMERICAN PIPIT (Anthus rubescens) – Lots of these s.w. of Phoenix on our first full day of the tour. CEDAR WAXWING (Bombycilla cedrorum) – We ran into a large flock of these along the Santa Cruz R. south of Tumacacori. Always beautiful to look at. PHAINOPEPLA (Phainopepla nitens) – This one is really tied to mistletoe at this season. ORANGE-CROWNED WARBLER (Oreothlypis celata) – Surprisingly few this year. The wintering races here are much brighter than any birds you'd see in the East. COMMON YELLOWTHROAT (Geothlypis trichas) – Most were heard calling deep within the cattails at our various wetland birding spots. AMERICAN REDSTART (Setophaga ruticilla) – This was a nice surprise for us on our first afternoon at Gilbert Water Ranch in the Phoenix area. YELLOW-RUMPED WARBLER (AUDUBON'S) (Setophaga coronata auduboni) – All of the Yellow-rumps that we detected on this tour were the expected 'Audubon's' Warbler, which will soon be again recognized as a species distinct from 'Myrtle' Warbler. BLACK-THROATED GRAY WARBLER (Setophaga nigrescens) – At least one of these with the mixed flock along the Santa Cruz R. south of Tumacacori. RUFOUS-WINGED SPARROW (Peucaea carpalis) – Great looks at a couple of very close birds in the little park in Green Valley. BREWER'S SPARROW (Spizella breweri) – Several close birds on the ground and atop the low bushes in Green Valley. I'm surprised that we didn't find more of these elsewhere on this tour. LARK SPARROW (Chondestes grammacus) – One of our fancier sparrows. DARK-EYED JUNCO (Junco hyemalis) – We saw at least three different subspecies of this one along the way (Oregon, Pink-sided, and Gray-headed). YELLOW-EYED JUNCO (Junco phaeonotus) – A couple of birds obliged us at the feeders in Madera Canyon. WHITE-CROWNED SPARROW (GAMBEL'S) (Zonotrichia leucophrys gambelii) – All of our White-crowns were this expected form which breeds in the taiga of Canada and Alaska. SAGEBRUSH SPARROW (Artemisiospiza nevadensis) – We had several of these sparrows sit up nicely for us, allowing us to see the pertinent field marks. Ever since the Sage Sparrow was split into two species, we've had to look a lot more carefully at them on this tour (where both species occur). BELL'S SPARROW (CANESCENS) (Artemisiospiza belli canescens) – One bird that sat up at Robbins Butte Wildlife Area was i.d. 'ed as this scarce and local wintering species. 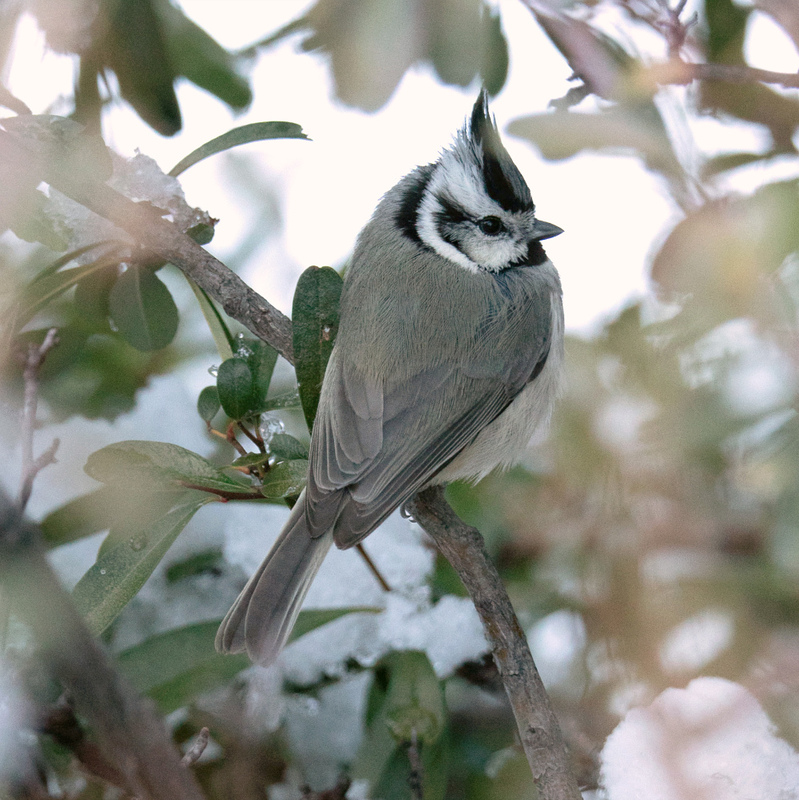 Participant Jim Greenway got this nice photo of a Mexican Jay in the snow at Madera Canyon. SAVANNAH SPARROW (Passerculus sandwichensis) – All of the birds that came in to my Baird's recording were this species. LINCOLN'S SPARROW (Melospiza lincolnii) – Amazingly scarce this year. CANYON TOWHEE (Melozone fusca) – This widespread Southwestern species stops just short of getting into California. ABERT'S TOWHEE (Melozone aberti) – This one's as close to an Arizona endemic as it gets. GREEN-TAILED TOWHEE (Pipilo chlorurus) – This one was seen well at the little park in Green Valley. I'm surprised that we saw just one the entire trip! SPOTTED TOWHEE (Pipilo maculatus) – The fourth species towhee that we saw on Day 4. NORTHERN CARDINAL (Cardinalis cardinalis) – The race here, C.c. superbus, is longer-crested, longer-tailed, and brighter red than birds that occur in the East. PYRRHULOXIA (Cardinalis sinuatus) – Several nice views south and east of Tucson. LAZULI BUNTING (Passerina amoena) – A lovely male at the feeders at Patagonia Lake SP was a bit of a surprise there. YELLOW-HEADED BLACKBIRD (Xanthocephalus xanthocephalus) – One of the most memorable sightings of the entire trip was seen 1000's of these – almost all of them adult males – at the Red Rock feedlot among the 100's of cows there. WESTERN MEADOWLARK (Sturnella neglecta) – These were much more common in the agricultural fields in the Phoenix area than they were down south. EASTERN MEADOWLARK (LILIAN'S) (Sturnella magna lilianae) – A common breeding bird and winterer in the grasslands throughout s.e. Arizona. Whitewater Draw provided us with the sight and sound of about 1000 Sandhill Cranes, in addition to sightings of Snow and Ross's geese, and Chihuahuan Raven. Photo by participant Jim Greenway. BREWER'S BLACKBIRD (Euphagus cyanocephalus) – That Red Rock feedlot was loaded with blackbirds, including this distinctive pale-eyed species. GREAT-TAILED GRACKLE (Quiscalus mexicanus) – One of the biggest N. American range expansion stories of our time. This one was unrecorded in Arizona before about 1935, and now it occurs as far north as s.w. Canada! DESERT COTTONTAIL (Sylvilagus audubonii) – This is the cottontail of the flat desert lowlands. Dozens at the Gilbert Water Ranch on that first afternoon! ROCK SQUIRREL (Spermophilus variegatus) – It was warm enough up in the Phoenix area for these guys to be out and about. COYOTE (Canis latrans) – A couple of sightings in the open country south and east of Tucson.